Best Oil Change in DeKalb! The inspection will be documented with photos sent to your phone and every service is performed by an automotive expert! Our New Cutting Edge Tablet Based Vehicle Inspection Sends Photos Direct to Your Phone! 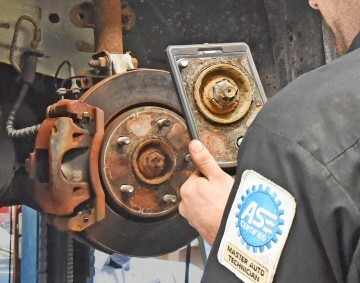 Motor Works is now using a cutting edge, tablet based, vehicle inspection system. This allows us to photograph any concerns requiring immediate discussion and text or email photos and descriptions to your phone. Motor Works can also text or email estimates and invoices. Customer can reply by text, email or phone. Our customers are loving this time saving convenience! *Some restrictions apply. Please ask. Motor Works technician Joe Moberg prepares to send a photo of a worn part directly to the customer's phone. WOW!